Jonas Gustavsson might be causing a bit of a goaltending controversy. The Boston Bruins might have a goalie controversy brewing. While the team's defense was not expected to be elite, the goaltending has also been an issue early for Boston. Former Vezina Trophy winner Tuukka Rask is not starting the season well, running a 1-3-1 record with a .856 save percentage through five games. That save percentage is way off from his .925 career average. 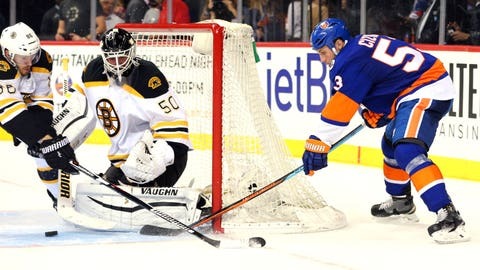 But while Rask is struggling, backup Jonas Gustavsson is doing better than expected, notching two wins in two starts while running a .896 save percentage. So is a goaltending controversy heating up? The easy answer is probably not. Rask has years of strong performances on his resume, and five games does not a season make. But coach Claude Julien does have a harder decision at the moment when choosing whom to start in net on a given night. Julien surprised some when he opted to start Gustavsson in goal on Friday in a key game against the Islanders. Rask's start is worse than just average; he has the second-worst save percentage in the league among starting goalies. But benching him seems like it would be a strange plan so early in the year. The Bruins have three days off ahead of Tuesday's game against the Coyotes, and it seems likely that Rask would get the start given how much rest he's been able to have, but these days, his presence in net is not as much as a given as it once was. MORE NEWS: Want stories delivered to you? Sign up for our NHL newsletters.